When planning an event the scale of the 2013 Green Inaugural Ball, it is easy to lose sight of what is truly important and why all of these amazing green groups have come together to host the Green Ball: to promote environmental protection, green jobs, and a reduced-carbon economy for future generations. The youth of today represent so much hope and love and all that is good with the world. So when jumped at the opportunity to connect our efforts to ‘green’ the ball with a local school and meet with some students from their garden club. 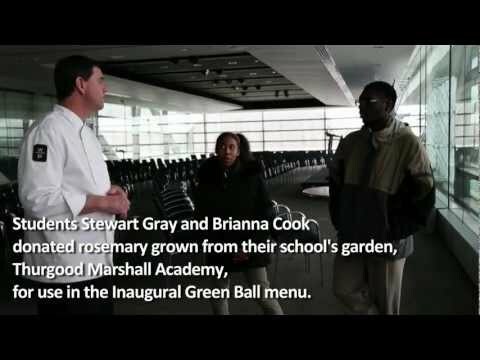 Chef Tom Blundell and Thurgood Marshall Academy junior Stewart Cook discuss squash in the Newseum kitchen, where preparations are underway for the 2013 Green Inaugural Ball. The organizers of the Green Ball reached out to DC Greens—an organization connecting communities to healthy food in the nation’s capital—to see if it was possible to procure fresh, local produce from one of the many school gardens around the District. DC Greens connected us with the Garden Club at Thurgood Marshall Academy in Anacostia, to see what products they had in their garden. The students and their garden have been featured on TV, including on the Food Network’s Show Chopped, and they’re frequently highlighted by the White House. The garden was inspired by First Lady Michelle Obama’s Let’s Moveprogram, which encourages healthy eating and living. Children at the school are engaged in planting, maintaining and harvesting ripe fruits and vegetables from the garden, and a robust cooking program teaches kids to cook what they grow. High school junior Brianna Cook reaches a tentative hand out as Executive Chef Tom Blundell (right) and Sous Chef Oscar Kabayama, hold live lobsters in the Newseum kitchen. The Newseum’s Chef Tom Blundell, of Wolfgang Puck Catering, invited representatives from the school to visit the Newseum and tour the kitchen and view food preparations for the Ball. The students presented Chef Tom with rosemary from the garden for use in some of the dishes that will be served to guests during the event. We were fortunate and excited to learn that their rosemary was thriving this time of year. Chef Tom said that he would infuse olive oil with the rosemary for use with the hummus, and they would use the remaining rosemary as garnish. Chef Blundell fielded questions from the students about his cooking inspiration—his mom—and how he found a passion for cooking. Having grown up on a farm, and then moving to Europe with his military family, Blundell was always exposed to fresh, farm-to-table ingredients. As a teen, he started working in kitchens as a dishwasher to earn extra money, but quickly realized the amazing connection between fresh ingredients and delicious food. He continued to work his way up through the kitchen ranks and realized that he could parlay his passion for food into a career. Chef Blundell now resides on a farm near the Eastern Chesapeake Shore in Maryland, where fresh produce and seafood are standard, and he brings his knowledge of these ingredients to Wolfgang Puck Catering. Chef Blundell also encouraged the students to start with the basics, and to use simple, readily available ingredients to prepare homemade products rather than rely on store versions, such as salad dressing and pie crusts. Both items are simple and cheaper to make at home. The students were then whisked away to the kitchen for the big finale, to view the preparations for the Green Ball. It was exciting to see all of the preparations underway and recognize specific items from the menu as they were being prepared. If you haven’t purchased your 2013 Green Inaugural Ball tickets, purchase them soon before the event sells out. Heading to the Green Ball? Don’t forget to tweet using the #GreenBall2013 hashtag.